See this pile of scraps? Tomorrow I want to show you what I do with my scraps and snippets. A few weeks ago, I celebrated my birthday. I thought I would share a few of my gifts. A friend of mine made a plastic bag holder for me. I was really needing one to handle the bags that were multiplying in the cupboard. Only a quilter would make a plastic bag holder out of toile. I love it! A new friend, who lives way up in Wisconsin, sent this to me. She made this from a beautiful saucer and candlestick. I have seen a few of these around, and think they are such a clever way of using a piece of beautiful china that has lost it's mate. Great for candy or a candle, or whatever your hearts desire. My youngest son ordered this online and had it sent to me. Isn't it just the prettiest little picture? I love Sandy Lynam Clough's artwork, and this one has the Bible verse from Proverbs 31:28. Great job for a teen, huh? The gift that keeps on giving. Need I say more? Isn't there something just so sweet and tender about a rose in your garden? Wow! What a pleasant surprise from Two Succulent Sisters. They gave me a PINK Fan Award. It is my very first award and I am so pleased it came from them. 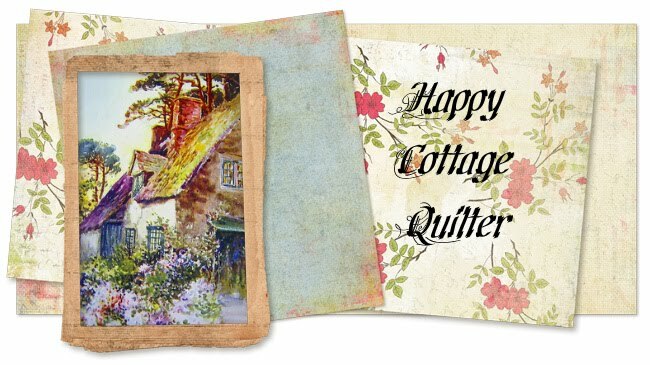 I just never expected to see the Happy Cottage Quilter on the list of friends they selected. I read many of the other blogs they selected and I feel a little unworthy of being in their company. I have so enjoyed writing about my little corner of the world, and having someone actually read what I write makes it even more special. Thanks Linda. Thanks bloggers! 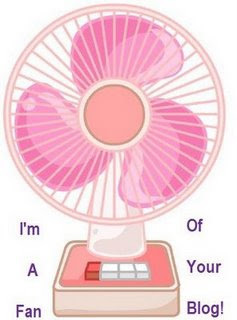 This fan belongs to you! Because without you, there wouldn't be a blog. My dear daughter and I have enjoyed browsing through antique and thrift stores in our area. We have found a few real treasures along the way. My dear daughter has a real eye for decorating so I thought I would give you a little peek at some of her personal decorating tastes. Cozy chair found on craigslist. Don't you love the antique skis?? You do know we live in Florida, right?? My dear sweet husband made these curtain rods for me several years ago. I just love them. We have them in several rooms. It's a super way to elevate your decorating statement. Very sweet simple pictures are above her headboard. I love how she has stacked these old suitcases at the foot of her bed. Very lovely linens are stored inside. And here is a beautiful quilt in the making. Don't you just love the fabrics? It is the same Bunny Hill pattern as my Cottage Quilt. It is going to be a real beauty. Just wanted to welcome you into our little cottage on this Monday morning. Hope your day is sew delightful! Okay, when you are on a shopping binge, and you come across something that can be reworked into a project, what's a girl to do?? I found this lovely 100% cotton skirt, which was 2 sizes too small, but might be something that could be made into a tote or an Amy B lookalike bag. The real deal on this skirt is that it was only $1. Now for $1 my seam ripper works really well. Would it be worth cutting up and trying a pattern that may later warrant LQS fabric? Today I found a piece of linen in the fabric remnant bin at Joann's. 34" is pretty close to a yard, original price $7.99 a yard, marked down to $1.89. Skirt on the left, linen on the right. Hummm..... seems to me it is an exact match in color. So maybe I can figure a purse pattern. How about the Buttercup bag by "Made by Rae"? Or the Hobo bag from jcaroline creative. What fun options. My dear daughter also has spruced up her room with her treasure finds. Guess the winter folks have all flown the southern coop, because most of the shops are offering generous discounts. She found these botanical prints for a song. And you remember those cute little creamers the restaurants would serve with your coffee? Who said they were just for cream?? Last week I won a prize from "I Have A Notion". Kelly had a sweet giveaway on her blog. and here is my prize!! Thanks Kelly! I am going to enjoy using these tags on my essentials. And you KNOW what that is, right?? Sewing machine bags, fabric totes, etc, etc. I think everyone should stop by Kelly's blog and pay her a visit. She always has some fun things going on. She also has an online store with lots of notions for you to browse through. So go take a peek. I think she is going to have a tutorial on making these great tags very soon. perfect with my spring dishes? It was the find of the day for $1. When you least expect it, there is a treasure lurking underneath. It will look so cozy on the back of my rocking chair. I love the pretty things that grow in my little piece of earth. So I thought I would share a few of the colorful delights that are gracing our yard right now. And if you look very closely, there is a little vegetable growing to be strong and one day will be red and delicious. Thanks for joining me in a little tour of our cottage backyard. On Saturday, my dear daughter and I went to a little town north of us. We decided that we would do a little antique hunting. I planned the trip on this particular day because the one and only quilt store in town was having a sale!! Yea! What fun it was to plunder through this little quilt shop. It was wall to wall quilters. I was in need of a thimble, and of course wanted to check out any new fabric that might have needed a new home. As the line stretched through the shop to have fabric cut, I decided that a few little fat quarters would do just as well. We headed to the antique shops for an afternoon of browsing. I have found some real treasures at bargain prices in the past. But on this day, my daughter came away with this precious little tea cup and saucer. Isn't it sweet? A genuine Wedgewood cup and saucer! I found this little demitasse cup and saucer at the same shop. As we strolled through the little town, we came upon a little shop with this charming resprite. Makes you just want to sit and watch the world go by. Let me first say that I have had a wonderful time visiting so many fellow quilters/bloggers on the first Bloggers Quilt Festival! It has been so much fun seeing everyones quilts and creations. And thank you all for the very sweet comments either here or sent to my email. I love hearing from each one of you. I hope there will be another one next year. If we can't show our quilts in a National Quilt show, this is definitely the next best thing. Karen over at the Selvage Blog asked how we store/save our selvages. I was saving them in a zippy bag, but found a nice little clear plastic container to serve that purpose now. My selvage collection is not very large at the moment, but it is growing. If I really needed more selvages, I could certainly cut some from my stash. I am taking the plunge and joining in on the virtual quilt show! What a very fun idea from the likes of Amy at Park City Girl. As I have said over and over, I am not a garment sewer. Two years ago, I met my BFF at the Chicago Quilt Festival. We had a wonderful time together. We looked at all of the fabulous quilts and of course all of the vendors. At one booth, my BFF saw this jacket. She immediately wanted to make one, and she said that I needed to make one too! Whoa-ho girl, I don't do garments! She finally convinced me and we purchased the pattern. As my BFF lives in cold country, and I live in the south, we have to use our time wisely when we do get together. BFF was coming to my end of the world and she said we were going to make these jackets! Whewww........ now I was in trouble. The first objective was to find a 100% sweatshirt. Ha, ha, well let me tell you that it is VERY difficult to find any kind of sweatshirts in Florida in the month of May! After much searching, we did finally come across sweatshirts that were 80% cotton. As I drove around, she had seamripper in hand and tore out the cuffs and the neck trim. We used the fabulous Kansas Troubles, and Thimbleberries line of fabrics. I love the rich color combinations. My BFF worked diligently on her jacket and I followed along. It was a very fun project and we both came out with great looking jackets. That year I decided to enter the jacket in the Florida State Fair. I have never entered anything in the State Fair before, but I felt that the jacket was something a little different and maybe was worthy to show. To my amazement, the jacket took a second place red ribbon! What a wonderful surprise. Thank you Amy for letting us be a part of the first ever Bloggers Quilt Festival. I am looking forward to viewing the beautiful quilts online. There are two really cool blogs that I have recently found. They are full of fun free stuff. "Make it do" is about using things you have around the house already. Which is always a great resource. And the other one is "Freebies for crafters". Lots of free patterns and designs. I could spend a lot of time looking through this blog. And while I am at it, check out Park City Girl's blog. She is hosting the first ever Bloggers Quilt Festival. Now what could be better then going to a quilt show and not have to leave your own home? And you can participate and there are prizes and everything. Great idea Amy. Today I had some errands to do. While I was out, I thought I would stop at a couple of thrift stores. I like to browse through and see if there are any great treasures to be found. At my first stop I must have come on just the right day because I found this little gem. Can you see that it is marked 20c? Even though I am not a garment sewer, I thought the book was so charming. It was published in 1966. A very nice addition to my sewing memorablia. Now I have looked at Quilts, Quilts, Quilts by Diana McClun and Laura Nownes for years. A couple of times I saw them at quilt shows in the resale bin, but I never bought it. Well today it was had for a total of 40c... Yes you heard me right, the complete guide to quiltmaking for forty cents! Whewww..... it was an amazing find! But that is not all............. there were 4 more quilting/craft books that I bought. They ranged in price from 40c to $1.91. I thought this book looked very interesting. It has primitive type patterns, which I think could be used in lots of projects. For a grand total of $5.62 I came away with six quilting/craft books that can be added to my ever growing library. I just love this sweet little girl! I found this tinplate picture at a gift shop last week. Who could not fall in love with the sweetness of the little round innocent face. The envelope says "To Mama" which just melted my heart. Just makes you want to scoop her up in your arms and love on her. She is hanging above my sewing machine table, and I so enjoy looking at those precious eyes. White POLKA DOTS!!!! I just about fainted when I found this fabric. So yummy. And the other pieces took me away too. The front piece is from the new Fig Tree collection "Patisserie". Polka dots and roses, what a combination. When my in laws bought five beautiful acres on a lake almost 60 years ago, there was nothing but woods way out in the country. They moved an old house there and raised their 5 little acorns. It has been a steadfast source where everyone likes to return to regather their roots. Today my dear sweet husband and one of our sons is out there mowing and preparing for the Easter doings tomorrow. I thought I would just share a little glimpse into the camelot where my dear sweet husband was raised. Looking forward to a beautiful day tomorrow. I was at my in laws today, sitting with my mil. The house is all decorated and ready for Easter. There will be a big picnic on Sunday afternoon, and all the extended family joins in the celebration. Sunday there will be lots of food, an egg hunt for the children, a raw egg toss (! ), singing, and the remembrance of serving a risen Savior. May the special blessings of this beautiful season fill your world with happiness. I found it very interesting that many of the comments that were left concerning how to display your quilts, don't actually use the quilts you make. I like to use my quilts as a part of decorating. As a landscape in my home. I change them as the seasons change, or the mood, whichever comes first. They are in baskets, on tables, as well as hanging from the walls. Looking at several art quilters websites, they show displays of their homes, and how they use their quilts to enhance a room or a bed. Funny thing is that I don't use the quilts on my beds. My youngest son is the only one who uses his dinosaur quilt every night. We used to have a quilt rack in our living room, but I found that it took up too much space and did not really display the quilts as much as I liked. So I have enjoyed rotating the quilts for the different seasons of the year. With no grandchildren in the near future, and a sister in love who makes some very beautiful quilts, there are few family members that receive quilts that I make. There was a time when I made a lot of charity quilts for Operation Home Front Quilts, and for the local children's hospital, until I kind of burned out on them. Now I try to make projects that are enjoyable during construction as well as becoming a part of my home. There are a few gift items on the burner right now, and hopefully I can get back to teaching beginners. It is always such a delight to watch a beginner toddle off and blossom into a quilt fanatic. Many have far exceeded my abilities.